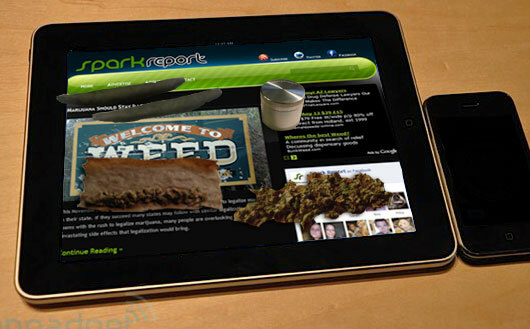 The new Apple iPad is set to hit stores April 3rd and Spark Report in honored to be the first marijuana site to get a hands on review the device. The iPad boasts impressive features such as 9.7 inch touch screen, 16-to-32GB flash drive, accelerometer and rechargeable lithium-polymer battery. The fingerprint-resistant oleophobic coating makes a perfect surface for both breaking up and rolling your marijuana. Where the iPhone lacks in multitasking the iPad makes up for by allowing you to run apps or surf the web while rolling your joint or blunt. We did notice that some marijuana tends to get stuck in the cracks around the device leading us to believe Apple may of spent too much time on the secondary features rather than focusing on it’s core use as a marijuana rolling pad. Our final opinion of the iPad is that it’s an awesome device for any serious marijuana consumer. The $499 price tag is hard to justify when compared to other rolling pads such as a magazine, notebook or DVD case but none of those offer the style that Apple devices are known for. Happy April Fools Day. For year-round shenanigans, follow Spark Report on Twitter.